"Dell Demps has yet to return a call to Lakers GM Rob Pelinka." 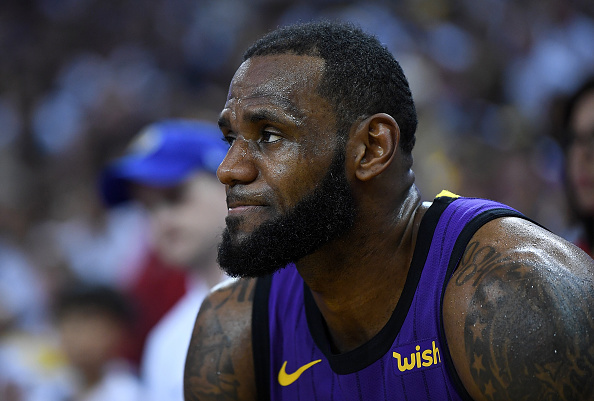 Anthony Davis is reportedly hoping for a trade to the Los Angeles Lakers where he'll get to team up with LeBron James, and whomever is left over from the blockbuster trade. Meanwhile, it seems that the New Orleans Pelicans are determined not to deal Davis to his preferred destination. According to a report by ESPN’s Zach Lowe and Adrian Wojnarowski, Pelicans GM Dell Demps is taking calls from all potential trade partners, except the Los Angeles Lakers. "As the NBA trade deadline looms within a week, the Lakers’ immediate pursuit of All-Star forward Anthony Davis is fraught with innumerable obstacles — including the fact that Pelicans general manager Dell Demps has yet to return a call to Lakers GM Rob Pelinka, league sources told ESPN." If the reports are true, that makes it highly unlikely that Davis will be moved prior to the NBA's February 7 trade deadline. The All Star center is reportedly unwilling to sign a contract extension with any team but the Lakers, although the Pelicans are clearly in no rush to make that happen. "As of now, the Pelicans see no reason to deliver Davis to the Lakers in a deal with a full season left on his contract -- never mind do it on a timeline that benefits mostly the objectives of Los Angeles and Davis." "New Orleans officials are prepared to play the long game on Davis' future, embarking on an uncomfortable, if not combative process that could extend months beyond next Thursday's trade deadline." According to Marc Stein of The New York Times, there "is a scenario under consideration" in which New Orleans would keep Davis on the sidelines for the remainder of the season "in the name of protecting its prized trade asset rather than playing him." The Pelicans could then look to move AD in the offseason, when the Boston Celtics would be eligible to make a competitive offer.